Most likely you'll fly in through Bangkok Suvarnabhumi Airport. As Bangkok's newest airport it began receiving international and domestic flights from 28th September 2006. It then replaced Don Muang Airport (DMK) as Bangkok's International Airport. His Majesty King Bhumibol Adulyadej chose the name 'Suvarnabhumi' which means "The Golden Land". You sure you're going through this one? Check that the code is 'BKK'. So let's say you're coming through this airport - what should you know about how to travel around it? Bangkok Suvarnabhumi International Airport is conveniently located in Racha Thewa in the Bangphli district of Samut Prakan province, about 30 kilometers east of Bangkok. The size of 563,000 sqm makes Bangkok's Suvarnabhumi terminal building the second largest in the world. Don Muang Airport was reopened for non-connecting domestic flights on 24th March 2007 and is now in operation along with Suvarnabhumi Airport. There are three airlines now using Don Muang Airport for domestic commercial flights, Nok Air, One-Two-GO Airlines and Thai Airways. Between the terminal building and the airport hotel are the two 5-storey car park buildings located with a combined capacity of 5,000 cars. Keep things clear and make sure you know your way in the elevator before you get on it. Brace yourself when you leave the airport hall after you passed customs. You will have to pass by a huge crowd of taxi drivers and people trying to sell you hotels- also at night. Make sure you aren't overpriced - there's a desk right outside the exit from where you can get an official metered taxi. The upmarket hotels often have their own shuttle/taxi service to and from the airport. Flying To Another Asian Country? Bangkok Suvarnabhumi International Airport is the main air hub for South East Asia and has good air connections. Air companies flying internationally to Bangkok include all Major airlines and of course Thai Airways. Bangkok, Thailand is located in the center of Southeast Asia. Taking longer trips to around Asia is also easy from Bangkok airport once you know which Thailand airlines will take you where you want to go. 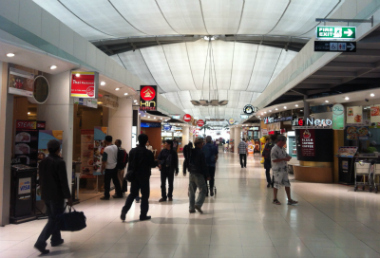 Many travelers coming into Bangkok Suvarnabhumi Airport get a connecting flight to some of the above mentioned destinations. As the airport is well organized and pretty reliable, it's easy to change flights. Directional signs are very well placed and it is easy to find your way around. After traveling around Asia for years I always like to come to this one. It is modern and convenient for South East Asian travel. Get to know your way around and you'll make yourself at home. Going to Pattaya? 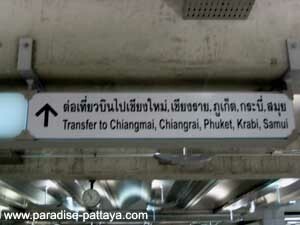 Make sure you've taken care of getting from Bangkok to Pattaya before you arrive and make your trip even smoother.